Hello good folks..... I'm late to the scene, although I look in this forum most days when BB airs. I had to join cos I wanted to air my final thoughts on this pathetic, boring, blah, predictable season. Worst cast of player's ever!!! I feel like I need to take a shower when I watch Paul. He is such a slimey git! Watching him egg on Josh to bully Jess/Cody, although not a fan of Cody, was the start of me disliking this season. I've switched off now... no more BBAD or watching the program airings. The only interest I have is reading your comments. I don't care who wins. If Grodner is involved next season I won't even bother to tune in cos I'm with Hugh " FIRE GRODNER"
With that I want to say thank you to y'all on this forum. Reading your comments has been WAY more interesting than watching what has sadly become of Big Brother. Same here. I stopped watching the shows. I just don't care. Oh and glad you posted!! Our group has dwindled considerably over the years. It's nice to have new people contribute. 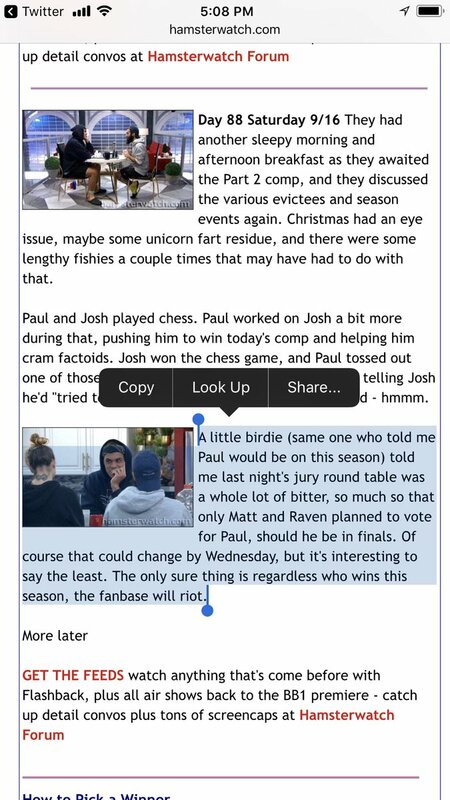 Josh could actually win this thing since the final contest has always been mostly guessing. If he does win final HOH it would be delicious if he picked Christmas. I'll have to go back and watch Taran Armstrong's (from RHAP) overnight update from yesterday the 16th. He mentioned the same story about the bitter round table, except I thought he mentioned hearing it from Grodner in an interview. If that is true... wonder what they started dishing to each other??? I've heard that Those who didn't see their good bye messages from the double eviction, got to see them privately in jury house. When Alex came to jury, people started to realize that every one was Paul's F3 and he had told the same lie to each one as they left, blaming the others (Josh and Christmas) for blindsiding him with the eviction. Paul lied to try to get their vote at the end. Nancy. Paul has said he never watched his season and only bits from previous seasons while in sequester for BB18. I truly don't think he understands how the jury system works. He has mentioned that while in the jury house, no one is allowed to talk about the game. Former houseguests have said that they are allowed to compare notes but only when the camera crew is there. I'm sure there is more talk when the handlers are not within ear shot. Paul is not informed about this and it may very well hurt him in the end. Paul's lack of knowledge on BB is really outstanding to me. For someone who was on the show, part of the online fandom... albeit the receiving end. Done fan events. Has the entire season he was on at his finger tips... he really knows very very little. For example... he keeps describing Michelle as this big horrible bully who just went from person to person calling them out on various things... when that didnt happen. If he had taken the time out of his all to important life to watch the season he would know soooooooooo much more. Paul has convinced a couple of them that Will... actually coaches the jury. Paul implied that Will will steer them. I was like Paul... that f-in dude does not care which of you guys wins... His care about the winner left the building a long damn time ago. Paul is immature. He is 24 going on 14. He is also a narcissist. Will may not care who wins each season but Grod does and she's paying him to 'direct' the jurors on how they should be voting. I honestly do not think he cares, especially this season. He really didnt like the comparison of him & Paul. I guess we will find out Wednesday. And knowing Will I have a feeling he is always trying to outwit the Grod. He is all sure sure Alison... & then doesnt. That would be Will, and I hope he takes it there! Paul: Thanks for tuning in and allowing me to come back again this summer, and for watching the gumpiness of Josh. I hope I didn't let anybody down. And thanks for getting boys...100% organic, grass-fed boys. I've heard him use both terms before, and got what they meant in context..I guess. Gumpy is a negative thing and Boys is a good thing? Just buzz words for the new crop of t-shirts he will try selling.